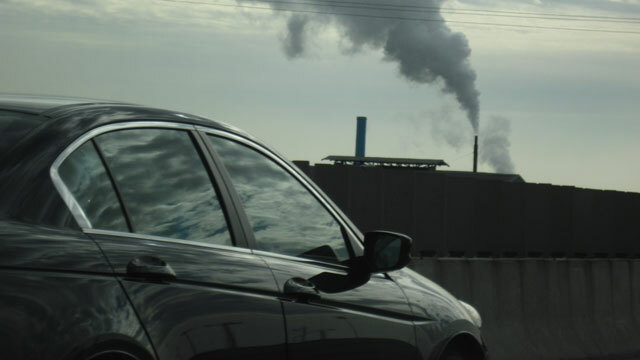 State Senator Darrell Steinberg is proposing a carbon tax on gasoline that would put a price on the pollution that causes climate change. The plan would also preempt a key piece of California's existing climate law, due to kick in next year. The state's cap-and-trade program, created by the Global Warming Solutions Act of 2006, puts a limit on how much companies in California can pollute by pumping out greenhouse gases. Right now, it only applies to factories, refineries and other industrial polluters. Next year for the first time, transportation fuels will come under the program: oil companies will have to account for the emissions from Californians' cars and trucks. The cost of buying additional pollution permits is one that companies are almost certain to pass along to consumers. Steinberg's plan would make it more direct, as a tax that we pay at the pump. His reasoning is that while drivers will pay more for gas either way, with a tax the increase is more predictable and transparent. "Under my proposal, the price of carbon fuel is projected to rise gradually and predictably," Steinberg explained in a speech at the Sacramento Press Club on Thursday. The Sacramento Democrat says his plan would also ensure that low-income Californians aren't inordinately burdened by higher taxes, by building in an earned income tax credit. "Putting a price on carbon fuels is essential to salvaging our environment. For climate policy to work, it has to sting," he said. "I am concerned about who we sting." "What people in California also need is pollution cuts," said Tim O'Connor, director of the Environmental Defense Fund's California Climate Initiative. He said that while he supports some of the ideas behind Steinberg's proposal, he's concerned it could undermine California's efforts to charge for the right to pollute, and to reduce greenhouse emissions overall. Cap-and-trade does both, by introducing a cap on emissions and then methodically lowering it, and by allowing companies to buy and trade pollution permits. The program launched in 2012. Opting for a tax instead of the market-based program might have been a good idea, said Severin Borenstein, an energy economist at University of California, Berkeley, but at this point, California is too invested in cap-and-trade. "The program is already running," he said. "The fuels coming in in 2015 is already something that has been very much accounted for and vetted, and it would take a huge change in the program to now take fuels back out of the cap." The Western States Petroleum Association, an industry group, welcomed Steinberg's proposal in a statement. "By acknowledging that the state’s cap-and-trade regulations for fuels are about to have a significant impact on the cost of fuel for consumers, Sen. Steinberg has proposed a transparent carbon tax as an alternative." Steinberg's bill would need a two-thirds majority to pass.